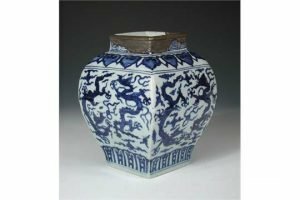 A blue and white vase, six character mark and possibly period of Jiajing, the rounded sides of square section, ruyi lappets painted on the shoulders above panels of pairs of dragons chasing pearls amongst the clouds, the feet with leaf lappet band. 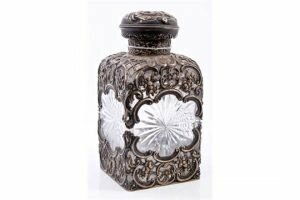 An Edwardian cut glass scent bottle encased in rococo scroll and floral mounts, engraved initials, with hinged domed cover embossed with classical scene. 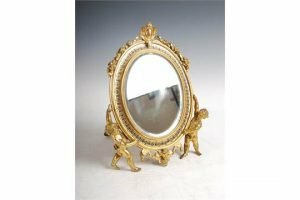 A late 19th century gilt bronze and champleve enamel dressing table mirror, the oval bevelled mirror plate within a blue, red and green enamelled border, with scroll surmount and putti supports, with strut support. 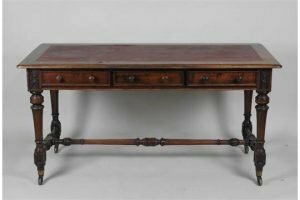 A Victorian mahogany library three drawer table, of rectangular form with replaced skiver, on four turned and fluted legs united by a turned conforming H stretcher on brass castors. 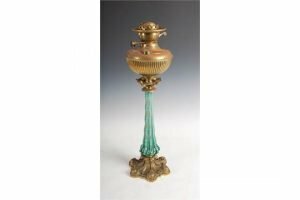 A late 19th century gilt metal mounted green, white and clear glass overlaid paraffin burning table lamp, with part gadrooned brass reservoir and facet cut tapered octagonal glass column. 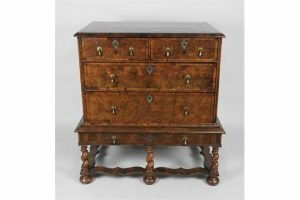 An early 18th century oyster veneered walnut chest on later stand, the radiating petal inlaid and crossbanded top over two short and two long drawers fitted with later brass drop handles on a single drawer later stand, on short barley twist supports united by a platform stretcher on compressed bun feet. 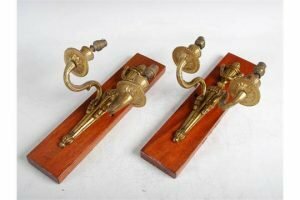 A pair of early 20th century gilt metal Neo-Classical style two light wall sconces, mounted on rectangular mahogany blocks. An 18ct gold diamond single-stone pendant, the brilliant-cut diamond with crossed double-bar surmount, suspended from a curb-link chain. Estimated diamond weight 0.20ct. 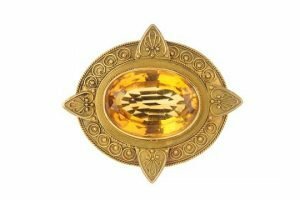 A late Victorian gold citrine brooch, circa 1880. The oval-shape citrine, within a cannetille and palmette motif surround. 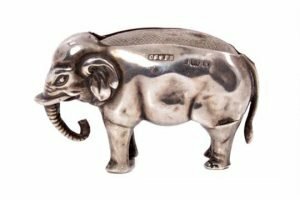 Edwardian silver pin cushion in the form of an elephant (Birmingham 1906), Cornelius Desormeaux Saunders and James Francis Hollings Shepherd. 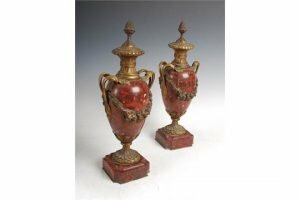 A pair of late 19th century ormolu mounted red marble twin handled urns, with foliate cast garlands and detachable acorn shaped finials. 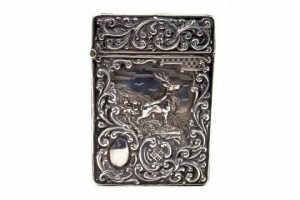 An Edwardian silver card case of rectangular form, with hinged cover and embossed rococo-style scroll and floral decoration, surrounding an image of a stag and two hinds. Birmingham 1906. 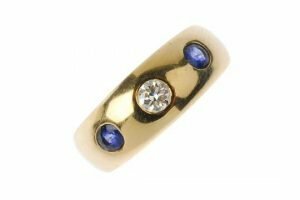 A diamond and sapphire band ring, the brilliant-cut diamond with oval-shape sapphire sides, inset to the plain tapered band. Estimated total diamond weight 0.20ct. 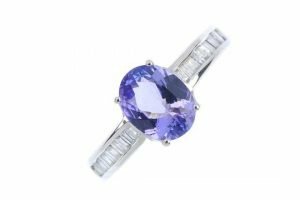 A 9ct gold tanzanite and diamond ring, the oval-shape tanzanite, to the baguette-cut diamond line sides and plain half-band. Estimated total diamond weight 0.25ct. Hallmarks for Birmingham. 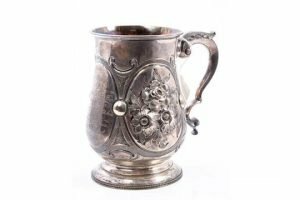 A Victorian silver mug of baluster form, with panels of embossed floral decoration and engraved presentation inscription, scroll handle and domed circular foot with bead border. 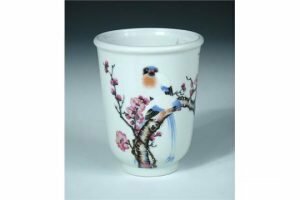 A Republic Period beaker, the exterior painted with two blue tailed birds perched on a branch of flowering cherry, four character mark of Qianlong in overglaze blue. 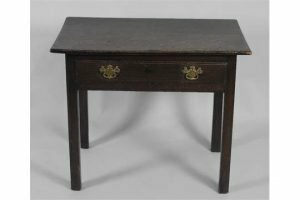 An 18th century oak side table, the rectangular boarded top over a single frieze drawer fitted with brass Chippendale style handles, on four square legs. 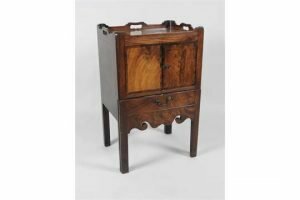 A George III mahogany night cupboard, the gallery top over two cabinet doors above a pull-out converted commode drawer with rectangular section front legs. 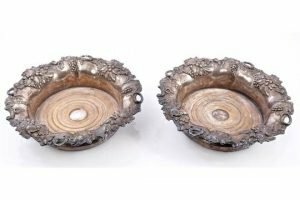 A pair of Victorian silver plated wine coasters of circular form, with grape and vine borders and turned wooden bases with central white metal bosses. 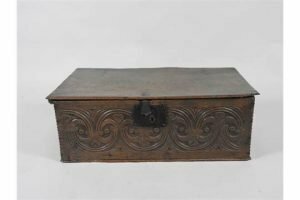 A late 17th century boarded oak bible box, the hinged lid over a central iron lock plate and interlocking flowerhead carved front, between chip moulded ends.